Nottinghamshire v Derbyshire LV= County Championship Div 1 - Day 3. 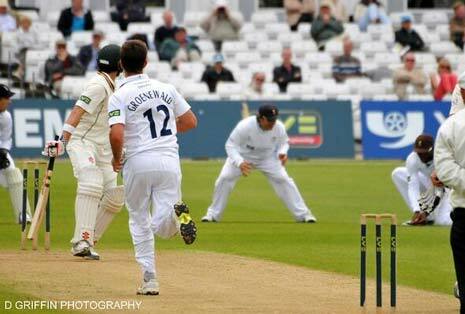 Tim Groenewald claimed his 200th career first-class wicket (below) - but an unbeaten century from Michael Lumb frustrated the Derbyshire bowlers on another rain-affected day at Trent Bridge. Mark Turner and Mark Footitt shared a 54-run final wicket stand to help Derbyshire post 391 in their first innings - before rain washed out the entire afternoon session. Play resumed after tea and James Taylor and Lumb shared a 121-run partnership, but paceman Groenewald broke the stand to claim his second wicket and simultaneously reach the career landmark - before Nottinghamshire lost a late wicket off the bowling of Footitt to close the day on 204-3, still trailing by 187 runs. After rain washed out most of the second day, Derbyshire began the third day on 306-6, with David Wainwright and Richard Johnson unbeaten on six and eight respectively. The pair made a promising start completing a 40-run stand before the visitors lost their first wicket of the morning as wicketkeeper Johnson was caught behind off Andre Adams for 22. Partner Wainwright, who was caught at slip for 22, and Groenewald, who failed to score, both fell to Franks in quick succession to reduce Derbyshire to 337-9 after 96 overs. But a fighting rearguard last-wicket partnership between Turner and Footitt handed Derbyshire their fourth batting point as the duo hit regular boundaries through both the on and off side - including 12 runs off one Samit Patel over - to move the visitors up towards 400. The partnership, however, was finally ended when Footitt was caught at long-on by Rikki Wessels off Patel for 24, as Derbyshire were dismissed for 391 just before lunch - with Turner unbeaten on 23. Footitt bowled with good pace at the start of the Nottinghamshire reply and he had Wessels hopping around the crease a number of times. The left-arm seamer struck the 27-year-old with a rising delivery, injuring the opener who had to retire hurt for nine after six overs. Internationals Ed Cowan and Lumb began the hosts' fightback, but their partnership only added 28 runs as Australia opener Cowan was caught at slip by Chesney Hughes for 24 off Groenewald. New batsman James Taylor joined Lumb in the middle and together formed a solid partnership, adding 121 runs inside 30 overs - as Lumb completed his half century from just 60 balls. Fellow England international Taylor, however, fell 10 runs short of the same feat as he was bowled for 40 by Groenewald who claimed his second wicket of the day to complete his personal milestone. Lumb continued his fine innings, meanwhile, and completed an excellent century from 120 balls before ending the day unbeaten on 115. But Derbyshire did claim a late breakthrough to secure their first bowling bonus point as Footitt had Patel caught at deep fine-leg by Shivnarine Chanderpaul for 9, as Nottinghamshire closed on 204-3, still trailing by 187 runs going into the final day. To view the Scorecard from www.ESPNcricinfo.com - CLICK HERE.